Sunglasses protect your eyes from the harmful effects of UV light… and they can look great too! What is UV light and why is it harmful?UV (Ultraviolet) rays come from sunlight. There are three types: UVA, UVB and UVC. UVC is absorbed by the ozone layer and does not reach the earth, but the other types of UV light are linked to possible cataract formation, skin cancer and/or retinal damage with long term exposure. Children need to protect their eyes from UV just as much as adults do. Very small children and babies should not be in the sun at all: according to the NHS toddlers and older should wear sun cream, a hat and loose, baggy cotton clothes, such as an oversized T-shirt with sleeves. Protect your child’s eyes with sunglasses that meet the British Standard (BS EN ISO 12312-1*) and carry the “CE” mark. Check the label or ask a registered dispensing optician for advice. You have a number of choices. Sunglasses can be made to your normal optical prescription. You can choose the colour and depth of tint: most people opt for brown or grey but a whole range of colours are available. Some frames suit clip on sunglasses. You might also opt for photochromic lenses that darken in sunshine. Ask your registered dispensing optician for advice on which option will suit you best. Sunglasses need to fit your face well in order to be effective at stopping UV light, so make sure that you get advice when choosing. Always look for the CE mark when buying lenses. Speak to a registered dispensing optician for advice on prescription sunglasses and fitting. Non-prescription sunglasses must meet the British Standard BS EN ISO 12312-1*. Prescription sunglasses should also comply with BS EN ISO 12312-1:2013 and BS EN ISO 8980-3. All sunglasses should carry the “CE” mark. 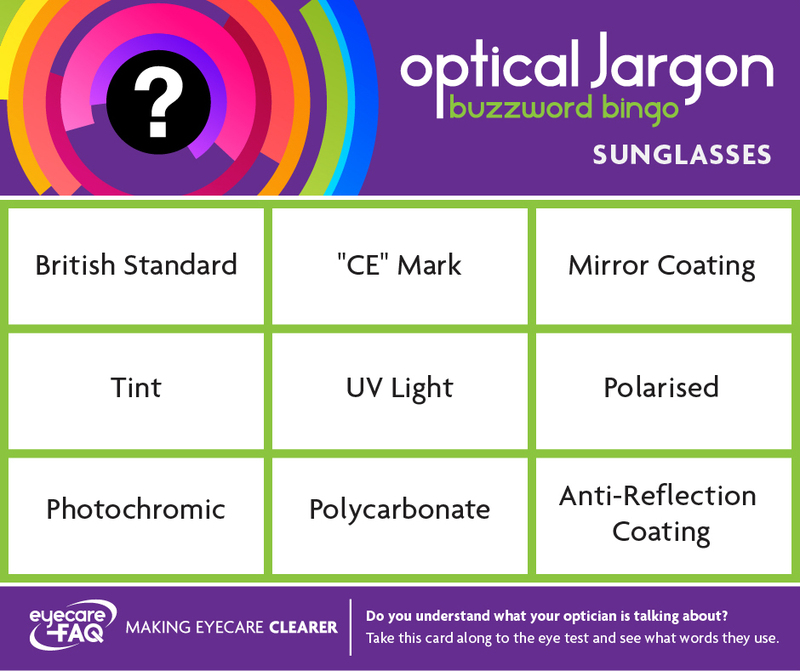 Check the label and ask your registered dispensing optician if you are unsure. Most sunglasses are suitable for driving in daytime apart from those with a very dark tint. An anti-reflection coat is a must. Most photochromic lenses don’t react inside the car. A mirror coating on polarised lenses is a very good driving/road use tint, especially in wet conditions on a bright/sunny day. Ask your registered dispensing optician about lenses (for daytime use only), which combine photochromic technology with polarisation. Where safety or wrap around glasses are needed Trivex or polycarbonate is commonly used. Trivex and Polycarbonate, in white form, eliminate 100% of UV light and are stronger than regular plastic lenses. Speak to a registered dispensing optician to find out if these types of lens will suit you. Polarised lenses which are the only truly anti-glare lenses are great for use on and around water (fishing, sailing, water skiing etc). A mirror coating on polarised lenses will counteract the increased UV being reflected from the water if you are out all day. Ask your registered dispensing optician about lenses (for daytime use only), which combine photochromic technology with polarisation. Photochromic lenses go dark in sunlight. They are great if you are generally light sensitive and if you prefer lenses that darken automatically to having to put sunglasses on and off. People with conditions such as albinism find photochromic lenses essential. Speak to a registered dispensing optician to find out if this type of sunglass lens will suit you. It is never safe to look at the sun, even with sunglasses on.